My desire to teach special needs children stimulated the idea of writing a novel using service dogs. When I retired from teaching, I researched service dog organizations, and found a local non-profit, highly-certified organization called PAALS. They train puppies to work with autism, mobility issues, and stress disorders. I volunteered with PAALS.org and began taking notes. As soon as my young adult, coming-of-age novel, Seven Days to Goodbye was published in August, 2014, I looked forward to doing author visits at middle schools. I loved teaching, and couldn’t wait to share my reason for writing this particular story. I wanted to encourage students to be readers and to increase their curiosity about telling stories and writing. I had used my experiences and memories from our favorite, Edisto Beach, to create Seven Days to Goodbye. The puppy raiser in the story, Trina, has seven days before her first trained dog will be matched to his forever companion. While on the beach, her dog makes a magical connection with a boy with autism. The story embraces the beach eco system, and a first-time romance. 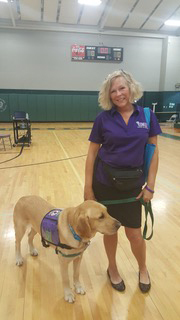 On my first official school visit, I had two hundred and fifty girls in a gym listening to me speak about autism, the beach, and the magic of a service dog. I explained I had used a real child’s experience and spoke about the boy learning to speak during their beach week. Since the school had ordered thirty-five books, the girls had taken turns reading the books ahead of time. The students asked many interesting questions, and I was surprised on how many students had never seen, smelled, or walked on a beach. My book trailer caught their attention. We had discussions about descriptive words, and then I showed another trailer about the training of service puppies, how they developed and learned to interact with people. This was a great way to talk about active verbs. During this session, it was fun to incorporate writing ideas and examples of revisions that were made on my earlier pages. And soon a dialog began on the fun of writing. Proceeds from my book and author visits, are donated to PAALS, to help them with the cost of training more dogs. If I have a volunteer living close to the school I am visiting, PAALS will send a dog-in-training. The trainer shares the dog’s skills and why these skills help a special need. When the person shares his or her companion dog, and explains how their life has been changed for the better because of their dog, I get goose bumps and teary eyed. Before you set up your author visit, explain to the media specialist why it is important to order books ahead of time. I usually sign books after I finish speaking, and try to have some one-on-one time. If some students can’t purchase a book, have it down-loaded on a few computers in the library for the students to share. I had one librarian actually ask the students questions about the book before they were allowed to join the visit. It is fun to brainstorm ahead of time about fun ways to convey the story message. I usually spend forty-five minutes on each author session. If the classes can be doubled, it makes it easier to cover all that you need to say before your voice wears out. Do set a limit on how many sessions you will do in one day. It is exhausting to talk long and repeat the same information. If you have local schools share the cost on your travel and lodging, you can spread the workshops over two days. I have the media specialist plan a writing workshop with smaller groups. And we mix up doing author visits and smaller writing workshops in one day. Creating a check off list for media specialists has shown to be helpful. If they have never had an author visit, this gives them knowledge on how to plan, what equipment is needed, and to ask for help from other teachers. For students who decide later to order the book, I ask for the students’ names and send signed stickers for them to add to their book. 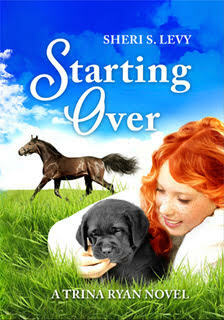 This coming school year, my new novel, Starting Over, will involve a new service pup, horseback riding, an unhappy girl who needs a friend, and the hard-life choices Trina realizes she must make. I am looking forward to new types of discussions, and I hope students will learn to be sensitive about reaching out to others who are in need. 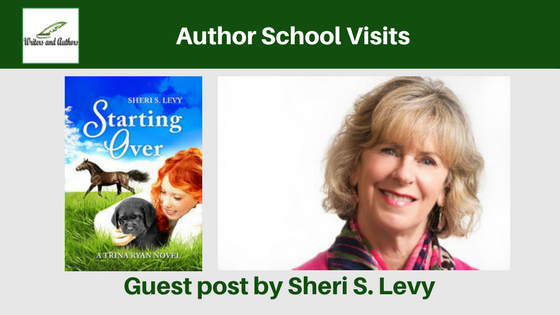 Sheri S. Levy is the author of an award-winning debut novel in her series, Trina Ryan’s Dogs in Training. Seven Days to Goodbye, won in 2015, and her magazine article, Scent with Love, won in 2011, with the Dog Writers Association in the Special Interest category. 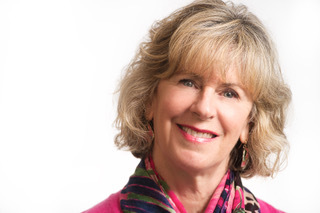 She is an active member of SCBWI and SIBA. After a twenty-five-year teaching career in special needs, Sheri remains active with tutoring teens in reading and writing. PAALS, (Palmetto Animal Assisted Living Services), has helped with her research on writing about service dogs and how they change lives. Sheri, in turn, shares her book proceeds to support PAALS.org. Sheri enjoys doing author visits and teaching writing workshops. When she is not writing, she reads, plays with her two dogs, listens to music, and hangs out with her husband and family.